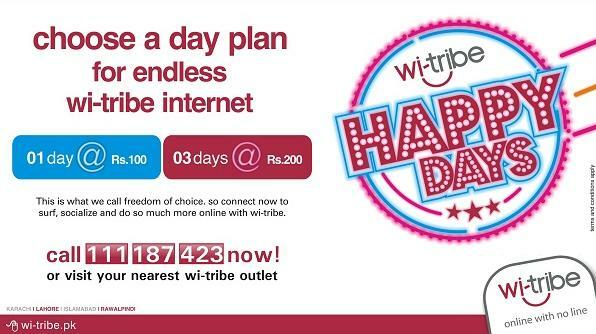 wi-tribe is offering its customers to enjoy un-metered downloads/uploaded on selected day(s) with Happy Day Offer. Offer comes in two plans, one with Rs. 100 for unmetered bandwidth in one day or Rs. 300 for unmetered bandwidth for three days. Download/upload speed will remain same as per you package plan. This offer comes only with regular packages and cannot be availed as a separate service or package. Phone orders have a credit limit of Rs. 200 per month. Plan A can be purchased twice or Plan B can be purchased once. Orders placed online have a 1-time purchase limit per month. This is a very silly offer, why would anyone pay for 1 day unlimited downloads and that in advance and some how could not use it. Some Relief for existing witribe customers with ample downloads to use this offer and schedule their downloads for 24 hours. wi-tribe is really going down as far as their service is concerned, so such promos wont help them at all. after replacing their director and manager customer care, i have experienced and found out that their service levels have gone down from 90% to less than 40%. god help them!!!!! !